It’s a conflict that emerges for many families: senior parents adamantly like to age in place in their own homes, while their family members are worried about their basic safety. And there’s a point to be made in both cases. Older adults, especially individuals who live alone, encounter multiple risks: falls that could bring about serious injury, difficulty in keeping up the lifestyle to which they’ve become accustomed as aging progresses, even a susceptibility to scam artists. Yet independence is key to self-worth, no matter the age. Defining a balance that meets the needs of both sides may very well be challenging, but there are several important factors to take into consideration that will help. • Let go of ageism. Because there is undoubtedly validity to worries over well-being for older adults in the home, especially when they live alone, the other side of the equation is our understanding of aging. Pioneer Network President/CEO Penny Cook explains, “Our negative perception helps marginalize older adults. They become ‘less than’ because that helps us cope and then we take on the parental model.” A shift in this reasoning lets us maintain the respect for seniors that they so rightly deserve, as well as understand how crucial it is for them to continue being as independent as possible during aging. • Communication is key. As with any conflict, calm, reasonable discussions are probably the best solution in diffusing challenging situations and arriving at a resolution that really works for the whole family. Sit down with your parent and talk about your fears, but get ready to listen with an open mind to his / her opinions and views. Bear in mind an answer might not be arrived at in one single discussion; use a preliminary conversation as a beginning point, and agree to revisit the matter occasionally to reevaluate. 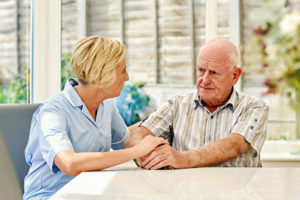 Most especially, recognize there’s a viable alternative: the experienced St. Joseph home health care services of Home Sweet Home In-Home Care. We’re able to aid in many different ways to increase well-being, providing family members peace of mind, while strengthening seniors to maintain independence, making their own choices and decisions within the comfort and familiarity of home. See which areas outside of St. Joseph we also service. Contact us online or call us at 269-849-9252 for an in-home assessment to find out more about our home care services.